Something to keep you busy nights would be a project like this giant B-25 Ukie. All its systems worked, too! Maybe after you completed it, you'd then sit up nights worrying about the test-hop. More peaceful is towline glider category ... Nordic class entry is being released by "mechanic." Flying is done on 60 ft. lines, three to six models compete in a race. Races are divided into three heats: 35 laps, no required reo fueling stop; 70 laps, one mandatory refueling stop; 140 laps, two mandatory refueling stops. First team completing required laps in heat or race is winner. A point system is used to score winners of 35 and 70 laps events for entry into 140 lap feature. Flying team cooperation is a big factor in achieving winning performance. One flyer and no more than two crew members comprise a team. The pit crew can make or break a winning flight by the speed with which they re-fuel and re-start the engine during the long lap features. C/L TEAM RACING - Grand-daddy of Rat Racing is Team Racing. The events are similar in some respects-35, 70 and 140 laps races being flown. There are also 7 lap qualification flights, 21 lap heats and 100 lap consolation races. This schedule has been copied directly from full scale airplane racing. Starts are made with all models released at once from mechanical "stooges" fastened to flying site surface. In Rat Racing takeoff release is done by hand by a crew member. Team Racing model requirements are more detailed than for Rat Racing. Engine limits are similar, .15 to .30 cu. in. ; engines must be completely cowled; minimum wing area is 125 sq. in. ; maximum fuel capacity 1 ounce. 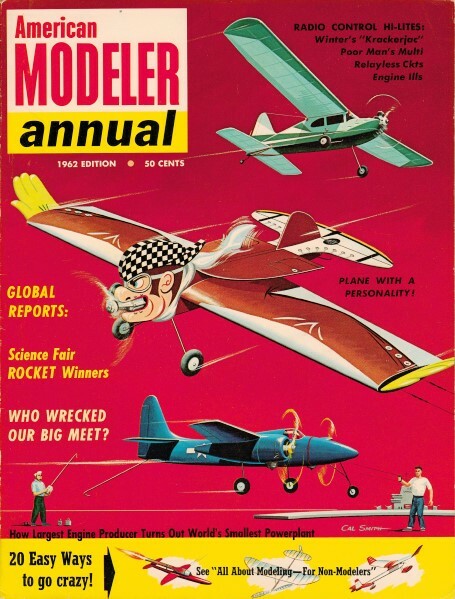 In addition, models must be semi-scale and resemble real racing airplanes. Cockpit must contain a dummy pilot's head and fuselage cross-section must be of specified dimensions. landing gear can be fixed or retractable. Tail skid must have loop at end to fit take-off stooge. Models must be colorfully painted and have large numbers on. fuselage. In some competitions, models are judged .for beauty and workmanship, bonus points being added to flying score. Team racing is the nearest thing in modeling to the exciting National Air Race Goodyear and Thompson classics of the past. There is action aplenty! When all engines are started and running, crew leaves the circle rim, then when the green flag drops all models are released at once. Take off can be hectic with grand tangles sometimes occurring. Once airborne, models pass and jockey for position as the laps pile up. There is plenty of action among the pilots and many team race fans watch the mad dance in the center of the circle rather than the models in the air. This wild type of model flying grew out of team racing and stunt. The mortality rate of engines and models here is higher than in any other contest event. This is strictly for the "Dive and zoom-go get 'em, Tiger" modelers. Crepe paper streamers 8 ft. long are tied to the tail of each model. 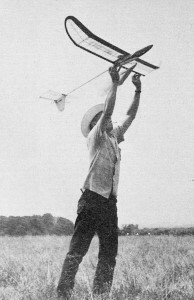 The object is to get on the other flyer's tail and cut the streamer with your propeller. Scoring is done by piling up the greatest number of "cuts" and "kills" during' a five minute flight period. "Cuts" are scored if paper streamer is cut and "kills" are scored if 30" string leader between model and streamer is cut. A "kill" ends scoring and "cut" and "kill" scores are totaled to determine winner and establish his standing in subsequent elimination rounds. Combat contestant matching is usually done by drawing lots, but order of entry or previous elimination scoring is sometimes used to pair off the "fighters." Combat flying can get real crazy, and a "kill" often means a collision - ho hum, back to the workbench. Inverted flying was once permitted (not under present rules) and dandy games of "chicken" and head-on bust-ups occurred with one model circling one way meeting the other model coming from the opposite direction. 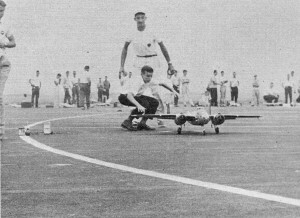 Short-coupled stunt models are used for combat because of their maneuverability. Favorite types are profile stunt trainers and the simpler all-wing designs. Maximum engine size permitted is .36 cu. in. Flying lines are 60 ft. in length. Models are usually about 36" wing span. Since balsa stock is cut to this length replacement or duplicate parts are easily made. C/L NAVY CARRIER - This highly challenging event puts a premium on flying skill and requires considerable gadgetry in the model itself. The object of the event is to simulate the performance of real carrier-based aircraft. The model must take off from a limited deck space, fly at high speed, fly at low speed, then make a landing into an arresting gear on the model carrier's deck. Competition is sponsored by the U. S. Navy and is usually run off only at the major national contests. However, some modelers enjoy carrier flying with their own simplified versions of the U.S.S. Smallfry, set up for club flying and smaller contests. Model carrier deck is 44 ft. long and 8 ft. wide. Its center line is curved to the perimeter of a 60 ft. radius flying circle. The deck is built of plywood panels with suitable framing underneath and is raised about 6" to 12" above the ground. All flying must be done off the deck and all ground area is considered "water." If model touches the "water" during flight it is considered to have crashed, ending the flight. The deck is divided into two sections, fore and aft. Forward section, a free-roll area for take-offs, is 24 ft. long. After part is arresting area, 20 ft. long, and has arresting gear across deck spaced 2 ft. apart. Arresting gear lines are suspended 1" to 11h" above deck. The gear is stout cord 18 ft. long and passes through guides at deck edges. Gear cord has 4 to 5 lb. sandbags attached at each end alongside deck edge. When model is landed on the deck, its arresting hook snags a line and weight of sandbags slow model quickly. This arresting gear is a miniature duplicate of actual early U. S. Navy deck landing experiments conducted in 1911. So much for the carrier deck. What kind of a model is flown off a miniature flat top? Complicated? Yes, to a certain extent. First, some sort of engine throttle must be used so that model can be flown at both high and low speeds. Engines with exhaust restrictors or intake chokes designed for radio control flying are well suited for use with carrier models, Throttle control systems operating from the flyers control handle are needed for high and low speed flying. J. Roberts Flight Control bellcrank and handle and Vari-speed throttle are specifically designed for this.